For me, there are few greater pleasures than being completely surprised by a movie. It doesn’t happen that often these days; thanks to the marketing barrage that surrounds most films and the presence of the internet, it’s hard to go into a movie without having a good idea of the content or tone. Yet Woody Allen’s Midnight in Paris is a disarmingly pleasant surprise, for the lone trailer, which I saw only once, reveals absolutely nothing about the film’s imaginative story and how its large cast is utilized. 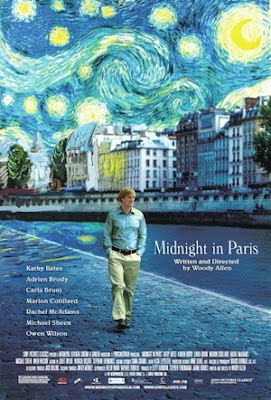 I expected one of Allen’s typical quirky comedies, something that would look nice but not, perhaps, do much to distinguish itself, and as I watched this incredible story unfold, I was happily amazed time and time again at all the unexpected gifts Midnight in Paris has to offer. If you too want to experience this film cold – and I suggest that you do – then by all means, read not another word of this review and rush to the theatre. You won’t be disappointed, as it’s easily the year’s best film so far. The first and most joyous surprise, for me at least, is that the main character, Gil (Owen Wilson), is a writer, and from the first conversation onwards, the film focuses on his creative process. His ambition in life is to be a novelist, but he quickly sold out to be a Hollywood screenwriter. A trip to Paris with his fiancée, Inez, and her parents has reignited some of his old dreams, as the streets of the city provide a spark for his creativity. I love films that analyze the creative process, especially when writing is involved; I spend most of my time writing or thinking about writing, so I find any story that dissects what goes into getting words onto a page fascinating. Yet Midnight in Paris soon turns out to be far more ambitious than a mere dialogue about writing – it quickly reveals itself to be a thesis about many forms of creativity, and the ways in which creative people are driven and how they interact with others. Gil’s fiancée and her parents are not creative people, and Allen seems to have a very fun time illustrating the gap between Gil’s world and theirs in wild, hilarious exaggerations. Anyone with creative ambitions can attest to the difficulty of being around people who have no desire to create; indeed, Inez and her parents are rabid observers of art, but have no understanding of how art is created, and no tolerance for people like Gil. Their fascination with Paris is material, while Gil is in love with the city’s atmosphere, and that leads him to leave them behind at night and take long walks through the streets. On his first walk, he is swept away by a group of exuberant bohemians, and suddenly finds himself transported back to the 1920s, an era he repeatedly romanticizes in the film’s early scenes. He meets some of his favorite writers, like F. Scott Fitzgerald and Ernest Hemingway, along with musicians like Cole Porter and painters Picasso and Monet. He quickly becomes friends with all of them, and learns from each in turn as he lives out his greatest dream of being a writer in early 20th century Paris. It’s an insanely imaginative premise, and Allen knows exactly what to do with it right from the start. If you’ve seen some of Woody Allen’s better movies, you know what sort of tone to expect; it’s light, whimsical, and often hilarious, with wickedly sharp writing and a well-measured pace. Most importantly, Allen allows the fantasy of the story to speak for itself; Gil is overjoyed at his circumstances, but he doesn’t stop to question why this is happening to him. He just accepts it all as reality, and that reality is almost never questioned from start to finish. That makes it very easy to become invested in the premise, and swept away in the story’s fable-like nature. Not only does the premise succeed tonally, but it also proves to be an extremely thoughtful dissection of the creative process. Gil meets many of history’s greatest artists on his journey, and learns quite a bit about himself and about art from each one of them, with the audience learning in tandem. Meanwhile, Allen also paints a vivid picture of how different eras exemplify varying forms of creativity, and how one era’s artistry always inspires the next. Anyone with creative ambitions can relate to the story Allen is telling, and find limitless meaning in the things these characters discuss. And what characters these are. The film’s trailer and poster list a large cast of big-name actors, and while all of them are exquisite in their roles, it’s the lesser-known faces who steal the show by bringing the artists of the 1920s to life. Tom Hiddleston, who starred as Loki in Thor earlier this year, is even better here as Fitzgerald, while Alison Pill, so endearingly cold in last year’s Scott Pilgrim, plays an energetic and memorable Zelda. Corey Stoll is both hilarious and poignant as Hemingway, while a number of other unknowns do tremendous work populating the 1920s. There are a few big names who pop up as historical figures, and they too are expertly cast; Kathy Bates is at her best as Gertrude Stein, and Adrien Brody’s over-the-top impression of Salvadore Dali is riotously funny. Marion Cotillard, continuing to prove herself as one of the best actresses on the planet, provides the film’s heart and soul as Adriana, a mistress to Picasso whom Gil falls in love with. She represents both everything Gil loves about this era and everything he looks for in a woman, and in the same way, she is a symbol for all the film is about. Suffice it to say, Cotillard carries that weight effortlessly with another mesmerizing performance. Gil himself is more or less your standard Woody Allen protagonist, which is to say he’s basically just Woody Allen. It’s a good thing, then, that Owen Wilson plays this part, as he’s the only actor of his age who can play Woody Allen just right; his laid-back nature and unique sense of comic timing makes him perfect for the role. In an interesting casting move, Rachel McAdams, an innately lovable actress, plays Gil’s fiancée Inez, who is an innately unlikable person. It’s certainly a strange part for her, but she pulls it off exceptionally well; she’s great with the dialogue and adds just enough humanity to Inez to stop her from being a cartoon villain. The characters are the heart and soul of the movie, and each member of the cast – which is so vast I’ve only brushed upon it here – is up to the task of reciting Allen’s thick and quirky dialogue. It all feels natural, which goes a long way towards making the film work. It also helps that Allen’s direction is sharper than ever, with gorgeous cinematography by Darius Khondji. Obviously, shooting in Paris gives the filmmakers a lot to work with, but as the generally ugly Pirates of the Caribbean 4 taught us, shooting on location means nothing if the people behind the camera aren’t doing their best work. Midnight in Paris looks fantastic, both in modern day sequences and in the 1920s. The aesthetics are different from each other, but both are beautiful in their own way, and as meaningful as I found the story, the film is equally enjoyable as a visual treat. Most importantly, Midnight in Paris spoke to me, and there’s nothing better than finding a film that connects on such a personal level. Woody Allen understands better than most what it means to be a writer, or even an artist in general, and he has many meaningful things to say here, things that even made me think about how I want to approach my writing as I move forward with college. I don’t expect everyone to feel as strongly about the movie as me, but I doubt many could walk away without a smile on their face. Midnight in Paris is filmmaking at its finest, the best movie I’ve seen in 2011 by a wide margin.